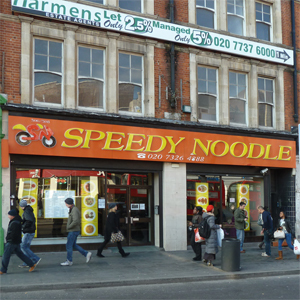 We had thought we would not have to review Speedy Noodle as we thought it didn’t qualify under our no chains rule – but it isn’t one. This Chinese style restaurant has been in Brixton long before it was transformed into a foodie destination. But it is a restaurant and although we considered changing the rules to exclude it we tonight (Saturday) decided to make another visit. This is a restaurant which is easy to book (there isn’t any). If you want to go out to the Ritzy and then you don’t have to saunter in the cold or hang about in a queues just go to Speedy Noodle and you can cut it very close and even see the trailers. It is also opens much later than most restaurants so you can have a starter and main before the film and dessert on the way home too. It lives up to its name – we were in and out in 20 minutes. The longest time was spent in choosing from the long list of Chinese, Malaysian and Thai items. On another occasion we tried the Thai Green curry which is passable and cheap. This time it was Singapore Vermicelli and a Malaysian Chicken curry. The Singapore noodles looked good with appropriate ingredients but wasn’t as spicy as it could be – but it was a bargain. That was the best bit of our meal. The curry was ….well was.. It had few ingredients – chicken and onions – but tasted less like curry and more like chicken in gravy. Despite hunger half was left on the plate. They have a license and sell beer and wine (by the glass and the bottle) but we washed all down with a pot of green tea. It was cheap – £10.20 for two. There are nearly 100 items on the menu so we could go back and try more and I am tempted to discover what a fried ice ball is or test the spicy calamari . But I think those culinary delicacies can wait for another decade. If I want cheap and fast food we’ll go to Gyoza down Coldharbour Lane unless we are starving at midnight.